An ex-pat Texan searches the streets of Toronto for the burger of his youth. All right-- no beating around the bush. I'm just going to come right out and say it. No beating around the bush like some greenhorn Boy Scout out on his first snipe hunt, standing in his shorts holding the burlap snipe bag with one hand while scratching his poison ivy rash with the other while dew glistens on the grass as the early morning sun comes cresting up over the hill, roosters crowing on fenceposts overlooking thousands of acres of Genetically Modified Wheat, dusted with pesticides and spliced with all different kinds of DNA-- "Tiger DNA? Whose bright idea was it to splice the wheat with Tiger DNA?" Junior Scientist Simmons raises his hand. "That would be me, sir. I was thinking we could give the wheat some stripes, make it more fashionable. We could corner the market on Fashion Wheat." Alas, the catwalks of Europe were not quite ready to be stormed by giant mobile stalks of tiger-striped wheat, sashaying forward twirling their roots like tassels-- especially not after the Tiger Wheat became enraged by the photographers' flashbulks and ran amuck, attacking the fashion crowd before Karl Lagerfeld beat back the wheat with one of his trademark leather jackets. Leather is indeed a versatile material but it is by no means the best part of the cow and definitely not the tastiest, even if you're a Charlie Chaplin hobo sitting down for a down-to-your-last dollar boot banquet. No, you need to rustle up some bucks, hunt beneath your sofa cushions for some spare change, go out and sell blood plasma if you have to because you will need the cash to go to the East Side of Toronto and head for The Burger's Priest and order The Best Burger In Toronto. Yep, it's true. Old news by now due to my glacial-style blogging pace but for those of you who haven't salivated at the sight of The Burger Priest's fresh-ground patties sizzling away on the flattop grill I have but one word for you: GO! Go now! Deceptively simple (no truffle oil infused nonsense here), incredibly fresh and astoundingly delicious California-style cheeseburgers are what's on offer. I usually get the Double Double, just called the 'Double' last time I was there-- did Tim Horton's threaten legal action? Were folks getting confused? "Let's see, I want two creams and two sugars on my burger. That's a Double Double, right?" WRONG! It's two perfectly-grilled patties and two pieces of American Cheese. There's a secret menu for those in the know. You can order things like the Vatican City, which is a Double Double with two grilled cheese sandwiches for buns. Or the Pope Burger, which is a Double Double plus an Option-- the Option is the Burger Priest's veggie burger, which is a giant mushroom stuffed with cheese, breaded and deep-fried. Speaking of deep-fried, the fries at The Burger's Priest are delicious as well. The only downside to The Burger's Priest is there is no seating in this tiny takeaway. There are four stools and in the olden days (last year) it was possible to perch and eat, scarfing down all that delicious grease but nowadays there are signs stating "These Stools Are For Waiting Only! Don't Eat Here!" Or other stern words to that effect. BUT WAIT! There's going to be a second location! Yes, the Yonge & Lawrence location will have 16 seats. No more standing in the parking lot! And oh, look, my dreams might be answered. The new location might have ONION RINGS. So what does all this mean for The Burger Quest? Well, I gotta tell ya, The Burger's Priest has really put a damper on The Quest. Every time I think about getting a burger, I head down to The Burger's Priest. Why take a chance on a possibly mediocre burger when I know what's waiting for me at the end of the burger rainbow? There are still plenty of burger joints in Toronto I haven't hit yet-- The Stockyards, I'm looking at you-- but man, right now I believe I have found Burger Perfection. Is it Texas-Style? Can a burger be both California Style and Texas Style? I'll save that debate for another day. And now, if you'll excuse me, The Priest awaits. Oh mercy me-- The Time, She Has Flown! I have been chowing down on tasty, tasty burgers but I haven’t been writing them up. Why not, you might ask? "Why so selfish, AGP? Have you been hogging Toronto’s best burgers? Huddled away in your burger cave licking your greasy lips, snarling at any burger lovers who get too close?" Um… yeah. No. Not exactly. Trying to make my way to King & Bathurst I get sucked into Streetcar Hell: Queen Car rerouted through one of Toronto’s many Construction Mazes, King Car delayed-- finally I get out and walk, pushing through the crowds, running about fifteen minutes late to meet my friend Corin Raymond (check out his tunes! Although no songs about burgers yet... c’mon, Corin!) for dinner. He’s about to pass out from hunger-- for me this is dinner but for him it’s breakfast, the first meal of the day. The restaurant is full (and I hear it gets really full during lunch) but our orders arrive quickly, served up on long rectangular trays lined with brown butcher paper: an organic burger with Gouda for Corin and a classic burger with the works for me. The burgers smell GREAT. The First Bite: AMAZING! Hot, Juicy, BEEFY. Perfectly cooked. The sesame seed bun is pillowy soft. We dig into our burgers and catch up, talking about music and movies and books. Later we’ll head to The Cameron House to catch the band New Country Rehab but for now it’s all about two old friends sharing fun burger-fueled good times. 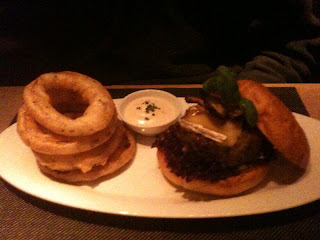 At the end of our meal Craft Burger became the Front Runner for Toronto’s Best Burger. Did it stay in first place? Stay tuned! South St. Burger Co. is a chain restaurant, part of the mighty NY Fries Empire. Burgers… and fries? It's so crazy it just might work! I head off to meet my wife Emma and her co-worker Stacie and Stacie's husband Rob. While I wait for the bus I estimate there are 375 dandelions in the yard across from the bus stop. Now there's a productive use of my time! The bus drops me off in front of a big-box strip mall that reminds me a lot of Dallas, right down to the stucco archways. Is this a sign? Does the Dallas-style burger of my dreams lie in wait for me just on the other side of that stucco arch? Only one way to find out! I step into South St. Burger Co. (which smells amazing-- like burgers. Go figure!) and scan the crowds for my wife. She's not here yet but this joint is jumpin': packed with parents and kids and what looks like two different birthday parties-- or maybe those kids are just really into balloons. Little kids are swarming everywhere, zipping around like neutrinos while harried Moms try to corral them back to their tables. I decide to wait for Em and Stacie and Rob outside. I grab a wrought-iron seat at an outdoor table and try to block out the music oozing from the speakers. Soft Rock? Adult Contemporary? Lite Jazz? Whatever it is, it's terrible. As Todd Flanders said on The Simpsons, "Ow! My Freaking Ears!" I watch other folks walk outside with their burgers . The smell of meat and ketchup wafts past my nose and I realize that I am freakin' HUNGRY. The burgers are served wrapped in wax paper on round metal trays. The burgers are BIG. That's a good sign-- or is it? Only if the burgers are any good. It's like that old joke: "The food here is terrible!" "I know-- and such small portions!" The music shifts to Paul Simon. Adult Contemporary. Where is my wife? I think I got here crazy early. My stomach rumbles. There’s a sign on the door that says ‘Burgers Made Well.’ I like it. Not too braggy. None of the usual “WORLD”S BEST BURGER!!! !” bragging. Still, if the crowds piling into this place are any indication, the burgers here must be pretty tasty. My wife arrives! We go inside and grab a table. A sticker on the door tells us this restaurant is powered by Green Energy. A paper placemat tells us the beef, buns, potatoes, chicken, cheeses and ice cream are all purchased locally. Em buys us a pre-dinner treat: a strawberry milkshake. It's amazing. Stacie and Rob join us and Stacie insists on paying for all of us. Well, if you insist… There are tons of toppings to choose from but I stay on the Burger Straight & Narrow: pickles, onions, yellow mustard. I unwrap my burger and take a bite. The First Bite: It tastes homemade! Straight from the backyard grill. It’s damn tasty. The onion rings are strangly “mealy.” They’re crunchy, but with an odd texture. Onion Rings? What was I thinking? This place is owned by NY Fries! Sunrise, sunset. Winter turns to spring. Time for a pendulum swing away from hoity-toity Gourmet Burgers and back toward the straight-up burger of the lunch counter. I’m meeting my friend Saira (who has Burger Quested with me before) at The Collegiate Lunch. I was tipped off to this place by Chowhound while looking for information about The Great Burger Kitchen, which is where Saira and I were planning to go today but it’s not open yet. According to the grumblings on Chowhound, The Collegiate Lunch is a few doors away from The Great Burger Kitchen and makes a delicious (and cheap!) diner burger. The Great Burger Kitchen is going to throw off the Burger Equilibrium of the neighorhood! Horrors! Or maybe not. I’m betting that a classic diner and a high-end burger restaurant can peacefully co-exist in the same block. We shall see! “The Collegiate Lunch” sounds like it should be full of 1950s style college students with blazers, buzz cuts, letterman’s jackets and pipes. Buddy Holly should be playing on the jukebox. Burly football players should be having eating contests (“If you eat 50 burgers, the 51st burger is FREE!”) and a girl named Molly with a ponytail, cardigan and a poodle skirt should be sharing a malt with a nervous fella named Chester. Sh-Boom (the whitewashed version by The Crew Cuts, not the original version by The Chords) should start playing on the jukebox as Chester and Molly fall in love. This is not what happens. “Gosh, A.G.! You mean the doorway of The Collegiate Lunch isn’t a portal into a movie about the 1950s?” Nope. Maybe we’re all better off. After all, I’m not here for a sock hop, I’m here for the burgers. The Collegiate Lunch is definitely old school. A row of maroon vinyl booths sit oppose a long lunch counter with vinyl stools. There are a few wooden tables and chairs at the back. Above the lunch counter is a staggering number of Minnie Mouse figurines. The woman who runs this place, I find out later, is named Minnie. A few old men in windbreakers and baseball caps sit socializing in the back booth. Saira and her baby Amara arrive, ready to chow down. We both order the house special: a bacon cheeseburger. Saira goes all-out and gets a side of gravy for her fries. Then we kick back and wait while a steady stream of regulars come and go. Everyone seems to know everyone else. There’s lots of laughing, shaking hands, and hugging. After a bit of a wait our food arrives. The burgers are served up on white oval plates with two strips of crisp bacon, grated cheddar cheese and a lightly toasted bun. Along with this I’ve opted for tomato, mustard and onion (hold the relish). THE FIRST BITE: Meaty! Hot and Juicy. The beef is super tender. The aftertaste is bacon. It’s incredibly delicious: a definite step up from the usual frozen patties found all-to-often in diners these days. And it’s CHEAP! For the price of one Bymark burger I could get ten—count ‘em, ten—of these beauties. Delicious, cheap, friendly—The Collegiate Lunch makes me think the Sh-Boom lyrics were right on the money: “Life could be a dream.” A delicious burgery dream. It’s a beautiful spring evening. Thanks to Daylight Savings, the light is still golden and beautiful as I ride the Coxwell bus down to the subway station. I’m heading across town to meet my wife and her aunt and uncle at Bymark, home of the legendary $35 dollar hamburger. I can see heads exploding all over the internet. “Thirty-five bucks?!? For a HAMBURGER? Is it some kinda Giant Hamburger? Is it served in a wheel barrow? Does it have a solid gold bun?” No, no and no. Bymark is a swanky joint where financial industry types go to throw money around and impress girls. But maybe—just maybe—this burger will be so good it’ll be worth the money. 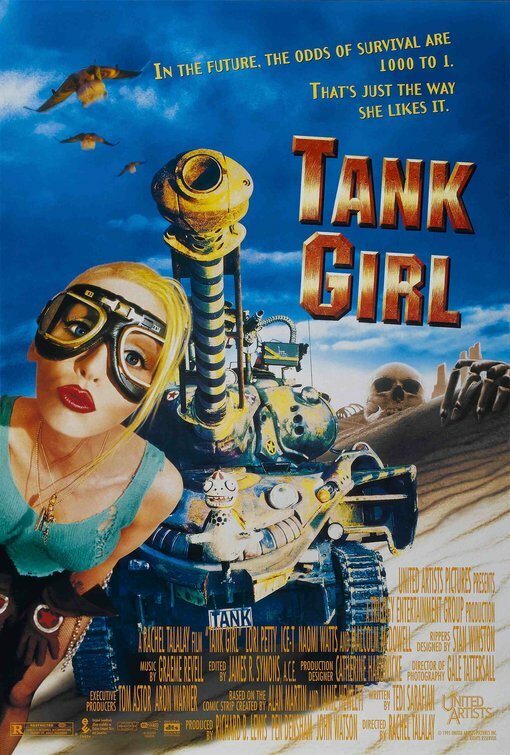 At Pape Station a woman gets on the subway rockin’ a Post-Apocalyptic ‘Tank Girl’ style outfit (minus Ice-T as a Mutant Kangaroo). These are Post-Financial Meltdown times, but The Recession still lingers, and here I am going to buy a thirty-five dollar hamburger. I feel a twinge of Capitalistic Guilt. This is a decadent splurge, like Roman Emperors gorging in the banquet halls before staggering off to the vomitorium (which apparently never actually happened...) But it’s all for The Quest. I vowed to leave no burger unturned, from the ritziest restaurant to the lowest dive, so now I must brush the dirt from my trousers, drag a comb through my beard and head into The Financial District. On King Street it’s strangely deserted. Most of the workers have packed up and left for the day, and the few that remain are tucked inside their offices, working late. Outside a bank I see two security guards rousting a hunched-over homeless woman. She is agitated and making sounds like an angry prehistoric bird. She needs help from dedicated mental health professionals, but in this case all she will get is a warning to move on. Then I step inside the TD Center and begin to negotiate the labyrinth that hopefully will lead me not to a snarling Minotaur but to a tasty hamburger. After a few wrong turns I find Bymark, where my wife Emma and her Aunt Katie and Uncle John are waiting. The Bymark dining room is gold and cozy. Very tasteful, very swanky. We’re in a basement so there are no windows, but the high ceilings cancel out the “you’re in a basement” effect. I sit down and a server materializes out of nowhere to present me with a choice of three different breads. I opt for the olive bread, which is hot and delicious. “Olive Bread?” I hear you saying. “What the Hell, man? When are you getting to THE BURGER?” Oh, it’s coming, folks. You can’t rush these things. First we get our appetizers. In keeping with the decadent tone of the evening, we all order another Bymark house specialty, the Butter Braised Lobster Poutine. Oh yes. Crisp frites (that means “fries”, only more expensive) with chunks of lobster covered in béarnaise sauce (doesn’t “béarnaise” sound like something bears would spread on a sandwich?) and served in a lobster shell. Brothers and Sisters, it is HELLA GOOD. Then we sit back, visit and wait for our mains. It takes a while but as I said, you can’t rush these things. And then… and then… it arrives. A beautiful-looking burger, served on a toasted and buttered white bun, nestled next to a tower of onion rings on a white oval plate. THE FIRST BITE is buttery and rich. The brie cheese almost overwhelms the beef, but there is definitely some grilled beef flavor. This burger is big, rich and juicy. The onion rings are amazing. They’re tempura-crisp with flecks of oregano fried into the batter. Afterwards I feel like I should light up a cigar with a hundred dollar bill. This is by far the most expensive hamburger I’ve ever had. It’s not so much a meal as it is an experience. I’m glad I was fortunate enough to experience it once, but it’s hard to imagine a return visit. Maybe if I stumble into some pirate treasure or win the lottery… who am I kidding? If that happened I would pull an Elvis and fly down to Dallas with my buddies to buy real Texas Hamburgers straight from the source. 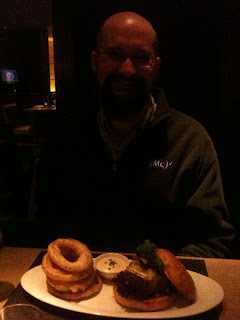 Still, that Texas-style burger might still be here in Toronto, sizzling away on an open grill, right around the corner. And so The Quest continues! The time, it flies! I’m way, waaaay behind on this here Burger Quest. Time to get back to it! Say, Gang! Remember Saturday February The 13th? That’s when I decided to mosey on over to The Gourmet Burger Company on Parliament Street. The very idea of a “Gourmet Burger” still strikes me as a bit strange. Nowadays, though, there’s all kinds of hoity-toity burgers for sale all over the world and Toronto is no exception. What would be waiting for me at The Gourmet Burger Company? An ostrich burger with aged gorgonzola sprinkled with gold dust? My guitar teacher Riaz and I decided to find out. That’s right— after almost ten years of making music with the Music Collective Miracle Beard as well as my own projects Placebo & The Effects and Flat Bread Sammy I decided it was about time I should learn how to play an instrument, you know, for real. After my guitar lesson Riaz (of the band Red Wing Bridge) and I wandered up to Parliament and Carlton. Inside The Gourmet Burger Co. is decorated in Basic Black and White, with a chalkboard menu. We order: I opt for a straight-up burger (hold the gold dust) with onions, mustard and pickles. Onion rings? Oh, why not? After a very short wait (five minutes) we’re called up to the counter to get our burgers, which are served on a round metal tray. Our stomachs rumble as we make our way back to our seats. Riaz sips his shake and says, “Wow—good chocolate shake.” He unwraps his burger and it looks so good I must dig into mine. The First Bite: I pick up the burger. The bun is soft, with a great consistency. (My father-in-law Randy later told me he’s had hamburgers with cold—like right out of the fridge cold—buns from here. Thankfully, on this burgering adventure the buns are just fine.) That grilled meat smell hits my nose. Salivating, I take a big bite and taste MEAT. There’s the perfect amount of juicy goodness. That great grilled meat taste lingers on my tongue. The bun-to-burger ratio is perfect. The onion rings are crispy, hot and oniony— not too salty. The batter is light and golden. Alas, this burger doesn’t awaken any Texas Memories— ah, the fleeting burger of my youth— but still, a positive burger experience all around! Except for my trip home, when a woman sailed right past the open streetcar doors, oblivious in her SUV. Because of idiots like her, always look for cars before stepping out of the streetcar. Let’s be careful out there, folks! NEXT UP: Gourmet burgers, you say? Then we must go to Bymark! Featuring burger pics at last! Welcome To A.G. Pasquella Books! Welcome to the Burger Quest's new URL! 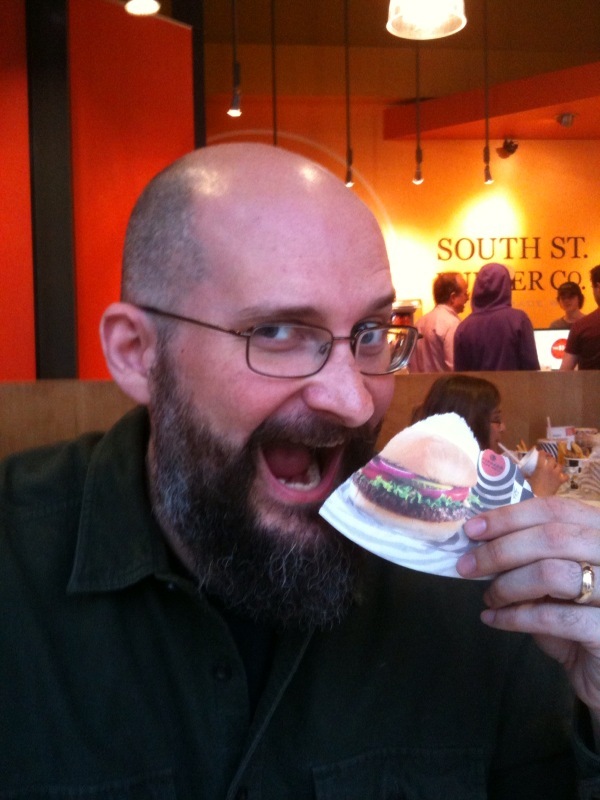 You can now find us at http://burgerquest.agpbooks.com. Same site, same burgery goodness: only now the URL is part of my brand-new website, http://agpbooks.com. Do you like the writing on Burger Quest? Come on over to A.G. Pasquella Books and see what else I've got for you! Plenty more Burger Reviews to come. Stay tuned! I was born in Dallas, Texas and now I live in Toronto, Ontario. My work has appeared in McSweeney's, Black Book, Wholphin, The Utne Reader, and The Future Dictionary of America. My book "Why Not A Spider Monkey Jesus?" (about a talking chimpanzee who becomes a televangelist) is available from http://agpbooks.com. Check it out!